The BMW 3 series navigation sytem is special for new BMW 3 series from year 2005 to 2006, 2007, 2008, 2009, 2010 and 2011, including BMW 3 series Saloon BMW E90, BMW E91 Touring, BMW E92 Coupe, BMW E93 Convertible and BMW M3. Versions include BMW 316i, 318i, 320i, 323i, 325i, 328i, 330i, 335i, M3, 316d, 318d, 320d, 325d, 330d, 335d. We have another BMW 3 series dvd navigation unit which is with similar original BMW navigation interface, check it here. Note: For BMW 3 series of E90, E91, E92 and E93, if your car has fiber optic cables to amplifier(you can confirm this info with your local BMW dealer), our unit does not support fiber optic amplifier, so you need to modify wires, and the installation is very complicated, so we don't suggest you buying this unit unless you can make sure your installer can install it in your car sucessfully, if your car has fiber optic cables to amp and insist on buying this unit, we are not responsible for installation, so in case you failed to install it, a return is not acceptable, please understand. Buy BMW 3 series navigation system now get 8 GB SD card with iGO8 maps for free! 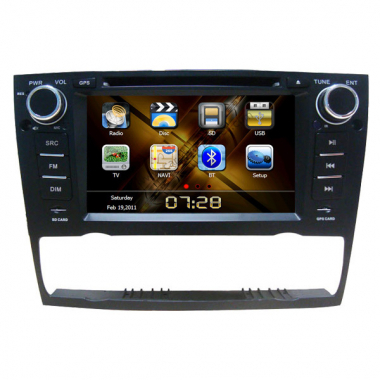 We have another head unit for the old BMW 3 series navigation, it's BMW E46 navigation system, which is one of our best selling car DVD GPS products. BMW 3 series dvd player supports MP4/DVD/VCD/SVCD/CD/MP3/CD-R-RW etc. Support Bluetooth wireless handsfree function, caller ID display. Multi-function IR remote control and instruction manual included. Analog TV-tuner with PAL/NTSC/SECAM: D/K. I. B/G. M video system. Digital TV of DVB-T(for Europe, Australia, South Africa, etc) or ISDB-T(for South America) is optional, ATSC for North America is not stable in some areas so we don't provide ATSC.